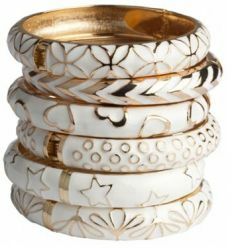 Gold Porcelin bangle bracelet featuring white enamel pattern with snap-back fastening. Patterns may vary. Wear two or three together for a statement look. Please note: Prices are for one item only.